With less than 10 hours of daylight, as autumn changes to winter (officially on the solstice, June 21), thoughts turn to soft comforts, good red wine and fireplaces. Given Cape Town’s reputedly damp, grey winters, there is a real scarcity of fireside dining venues. Yet on wine estates they abound, and grace some of our better restaurants, among them Steenberg, Delaire, Glen Carlou, Haute Cabriere, and of course at Constantia Uitsig, La Colombe. 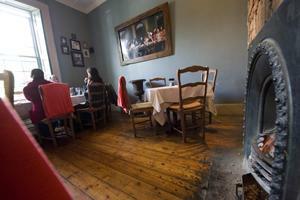 In the city bowl, several historical homes that have been converted to restaurants still burn log fires. The Opal Lounge has two, but the place itself is suffocatingly pretentious. Asoka, Rick’s Café, and Rafiki’s also have open hearths, but all three are extraordinarily rowdy places and dinner is not their priority. The Societi Bistro however strikes the right note. Formerly in the V&A Waterfront, where they had a good name but were philosophically quite out of place, they relocated to a charming heritage property with sash windows on Orange Street. It’s been home to several restaurants and lounge-clubs over the years. They have three fireplaces counting the inglenook. My adventurous dining partner, Munchkin, who has ironically given up tobacco, was smoked out one night by damp wood. There are several rooms to dine in, and on Indian summer nights (we had a spectacular few this past week) one can also dine on the large patio, surprisingly undisturbed by the traffic. The popular bar, dubbed The Snug, is subtly decorated with vintage erotica: Physique Pictorial postcards of muscular American hicks wearing nothing but lunchbox pouches. The dining areas are homely with wooden floors and exposed red brick, gentle lighting, and playing softly in the background those Putamayo French compilations. A large window inset with a grainy black and white photo of the Eiffel Tower cues one for what to expect from the menu. Owners Tammy Botbyl and Peter Weetman are full of proactive concepts: they offer a chauffeur service; a chef’s table starting at R200 per person; three- or five-day courses under the banner ‘Kitchen Unconfidential’ (Anthony Bourdain is obviously one of the chef’s heroes) where you can train to “dice onions like a pro”, make custard and get a “complimentary callous”. They also sometimes offer enticing discounts to theatre-goers at the Intimate across the road. On one of the five occasions necessary for this review, I dined after Gaetan Schmid’s wonderful physical comedy Rumpsteak about a French restaurant. Having just witnessed how Schmid enacts an entire kitchen in suspended animation when the Michelin critic orders nothing but a single egg, I am glad I don’t carry anything near such responsibility. But the point is: French cuisine is so codified, dishes can be evaluated and rated on a comparative basis with reasonable fairness. Head chef, Stéfan Marais, appropriately for a young chef mastering his art, is not attempting to take us into new territory, but to provide us with well-proportioned, honest comfort. His method is classic not traditional. I admit, some nights, I did feel like the chef’s guinea pig, which is not entirely fair on the paying customer. His approach is akin to Raymond Blanc’s foolproof French cookery, though Marais could learn a few things from Blanc on presentation. A certain sloppiness and understatement here is of course intentional; the kitchen aims to be a neighbourhood restaurant; the staff to give an open house feel. Many specials cover the blackboards, with soup, salad, fish changing daily. The a la carte autumn menu, like the season, is a sort of in-between arrangement; not quite summery Italy, not quite wintery Belgium. To his credit, Marais promotes local and seasonal produce, changing the menu quarterly. The wine list has an adequate price range; well-chosen cheaper options (such as the Flatroof Manor Merlot for R78 and the flinty Hill & Dale Sauvignon blanc for R60), and an additional list of more expensive special wines. Only one kind of farm bread is served, which is a pity, since depending on one’s menu choices the options of baguette or perhaps an olive sourdough would enhance the meal. Marais likes his soups chunky it seems; even for a minestrone (R38) it was shy on liquid. The tomato and parmesan Tart (R40) will be familiar to diners as it is identical to the one introduced to Cape Town by the Savoy Cabbage’s Janet Telian in the 1990s: halved tomatoes, insides scooped out, baked on a disc of buttery puff pastry that has been sprinkled with Parmesan, and topped with torn basil. The lamb liver starter (R38) was overpowered by too piquant a sauce; the veins and connective tissue had not been trimmed properly, which is more important with lamb than calf liver. The ox tongue (R38) with dauphine potatoes, capers and parsley cream is a safe bet, as is the beetroot carpaccio (R32) crisscrossed with horseradish mayonnaise. For starters, I highly recommend his rich, chicken liver parfait (R42) as wonderfully accomplished; also the sautéed duck liver salad (R44) with endive and apple, drizzled with a balsamic vinaigrette, although they overdo the wads of toasted bread. For mains, the pork neck (R92) with apple and sage stuffing and a mustard and pancetta sauce is a signature dish. The Cape fish (R90) was a well-prepared kabeljou, but the white polenta was tasteless. The waitress removed it without hesitation and offered alternatives. The springbok venison pie (R115) is a take on a shepherd’s pie with mash gratin browned on top. The sirloin (R110) comes sliced with a choice of béarnaise, café de Paris butter or a sauce moutarde (which is on the mild side). Mushroom risotto (R94) is a filling dish and can be monotonous, so it’s also offered in small portion for R64. It is intense and flavourful, with thyme and bay coming through, a little on the wet mushy side, but not offensively. Cream seems to be added, and not left purely to the creaminess of the rice starches; threads of spinach and Parmesan grated by a waiter completes this recommended main. The lamb shank (R130) is a generous size with lots of red wine sauce, mash and carrots. The pork belly (R102) is not yet fully understood; the crackling was wet, the citrus slices too sharp. The best part was the slightly liquorice sauce. The artisanal cheese platter is sparse and here the presentation shows itself to be a shortcoming. The camembert was passed à point and far too ammoniacal. The vanilla ice-cream (offered complimentary on my third visit) is a safe dessert. In short, Societi is a popular, well-run, comfortable, homely neighbourhood eatery. I noticed Tony Jackman, a food critic colleague, also relaxing here. Societi Bistro, 50 Orange Street, Gardens, Cape Town.Tel: 021 424 2100. Open Monday – Saturday: dinner until 11pm; lunch from noon; Saturdays brunch from 9am.